PNNL has multiple laboratory-scale distillation systems for atmospheric and vacuum distillations. The systems are typically operated in batch mode and provide for solvent removal and recovery as well as product recovery and distillation. A vacuum, fractional distillation system provides efficient separation of distillate fractions for fuel blendstock. Distillation products are provided for analyses and/or further testing. The Pope Wiped Film Distillation system is a continuous distillation unit. It is designed for purification of temperature sensitive materials and to increase the precision of distillation cuts. The feed hopper to the unit is 2-L, which can be continuously replenished to distill on the order of 10-20 liters/day of material. In its current configuration, the system is capable of operations up to 200oC, at atmospheric pressure or under vacuum. This intermediate scale is critical because it allows, for example, traditional fuel analysis to be conducted (e.g., RON or MON), so that the material can be compared to petroleum based fuels. Many of these analysis techniques require over 1-L of material, which can be achieved in a timely and efficient manner at this scale. A larger-scale, skid-mounted continuous flow distillation system, with a nominal feed flow rate of 1-4 gallons/hour is also a capability that resides at PNNL. The system operates at ambient pressure and up to 425°C. The column itself is comprised of stainless steel packing to enable efficient separations. This system is well-suited to produce gallon quantities of materials (e.g., ~30 gallons/day) that can then be used for more detailed analyses and/or engine testing, for example. Limitations The wiped film system is currently limited to 200°C, but this temperature can be increased if the Teflon wiper blade assembly is replaced with carbon wiper blades. With this addition, the entire system is limited to a 490°C maximum working temperature. The minimum-sized sample is about 500 ml. Unique aspects This wide range of distillation capabilities enables one to progress through the fuels or products analyses/qualification process in an efficient manner. Smaller sample sizes are required for initial analytical tests, then larger quantities are typically required for more in-depth and rigorous testing as well as for engine testing. Availability There are no significant limitations on the system’s use and availability as long as the feedstock can be distilled and does not thermally polymerize. 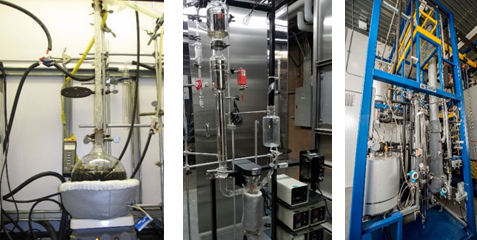 Laboratory-scale Distillation System (left), Wiped Film Distillation System (middle), Skid-mounted Distillation System (right).